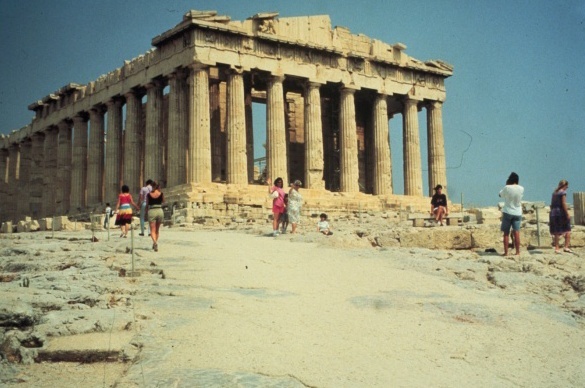 Greece is a country that has highly influenced all of our civilization and where many travelers are often confused between the compelling intrigue and fascination of the sometimes brutal but highly educational ancient Greece, and modern Greece with its reputation for an idyllic landscape and a friendly party-oriented people. Many languages, traditions and cultures around the world are strongly influenced by the classical Greece of 2,500 years ago, and much of that history is stripped bare as generation after generation of travelers marvel at iconic features like the Parthenon on the Acropolis overlooking Athens; Olympia, the site of the first Olympic Games; the 4th Century temple of Zeus; Hadrian's Arch; and the Theatre of Dionysos, which housed over 20,000 people and saw centuries of fighting, dancing, singing and of course, typical Greek feasting. Then there is modern Greece, a country of amazing natural beauty that is enhanced by the palaces and unique architecture hewn into the landscape, and the unmistakable culture, weather and friendly people. Where do you think the BEST HOLIDAY DESTINATIONS are? The history of Greece in the following video may help you understand a little more about this incredible country. The ultimate in Greek hospitality PLUS an amazing home to stay when you are in Athens - "Villa Sunset - Lagonisi"